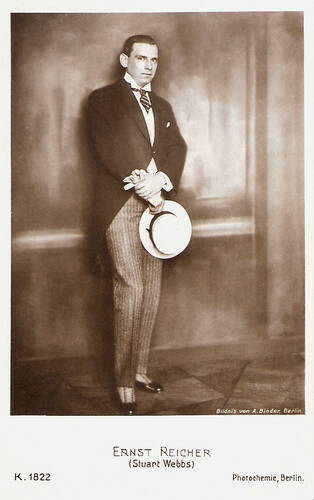 Ernst Reicher (1885-1936) was a German stage and screen actor, director, screenwriter and producer, famous for his Stuart Webbs detective films. German postcard by Photochemie, Berlin, no. K.1325. German postcard by Photochemie, Berlin, no. K.1821. Photo: Alex Binder. German postcard by Photochemie, Berlin, no. K.1822. Photo: Alex Binder. German postcard by Photochemie, Berlin, no. K.3076. Photo: Stuart Webbs Films / Zander und Labisch. 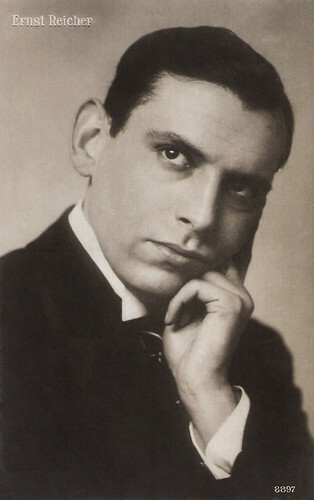 Ernst Reicher, born in Berlin in 1885, was the son of actor and director Emanuel Reicher. He attended the Landerziehungsheim Dr. Lietz in Ilsenburg, a boarding school on a pedagogical reform base, deliberately situated in the countryside. Afterwards Reicher attended the Academy of Dramatic Arts in Berlin, led by his father. 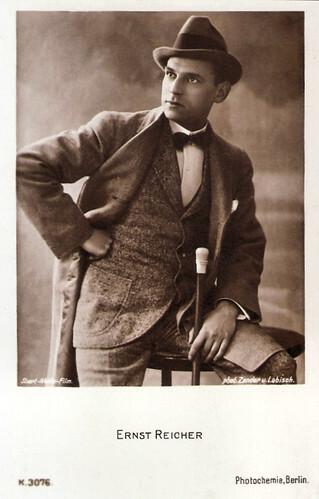 After further training in Italy and London, he debuted in 1909 at the Munich Kammerspiele. 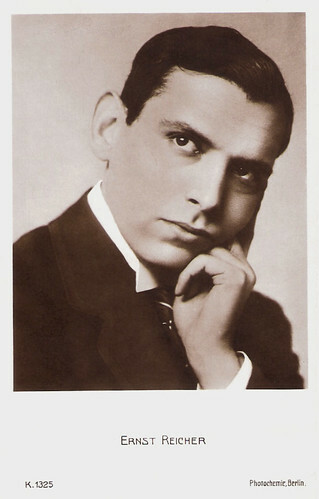 In 1910 he played in Rixdorf, in 1911 at the Neues Theater in Frankfurt and in 1912 in Berlin. 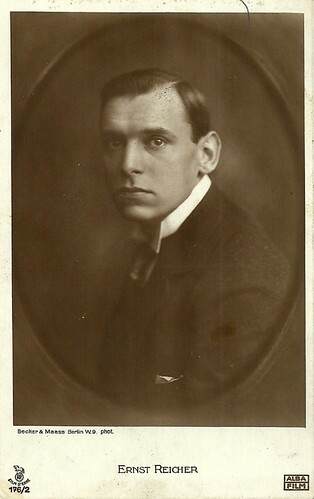 In Berlin, he met film director Joe May under whose direction he acted with his father in Heimat und Fremde/Home and away (Joe May, 1913) and thus became known. 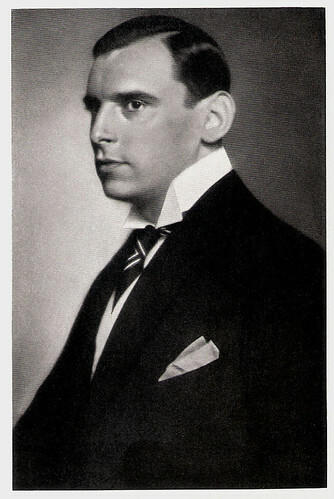 Shortly thereafter, he played in the musician's biopic Richard Wagner (Carl Froehlich, 1913) the part of King Ludwig II. of Bavaria. Reichers own directorial debut was the film Das Werk/The work (1913). At the end of 1913 Ernst Reicher invented the character of the detective Stuart Webbs. In this role he stood before the camera for twelve years and established in the German area the genre of the detective film, starting with Der geheimnisvolle Villa/The Black Triangle (Joe May, 1914) for Continental Art Film GmbH, which had sets by future director Paul Leni. The most popular of the Stuart Webbs films was Das Panzergewölbe/The armored vaults (Joe May, 1914), of which Lupu Pick made a remake starring Reicher in 1926. Co-actors of Reicher in those years were e.g. Max Landa, Lupu Pick and Werner Krauss. After arguing with the Continental Art Film GmbH, Reicher and May formed their own production company in 1914 called Stuart Webbs Film Company and opened a studio at Berlin Weissensee. Already in 1915 May withdrew and launched his own Joe Deebs detective series with Max Landa in the lead and later on Harry Liedtke. 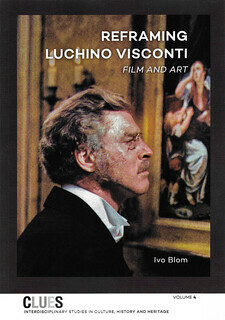 German collectors card by Ross Verlag in the series Vom Werden Deutscher Filmkunst - Der Stumme Film, no. 47/41. Photo: Schenker. 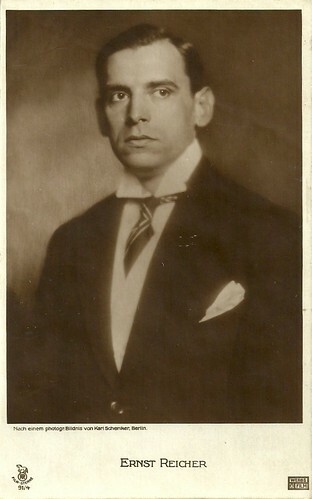 Caption: Ernst Reicher, der Detektiv Stuart Webbs. German postcard by Verlag Hermann Leiser, Berlin-Wilm, no. 1607. Collection: Didier Hanson. Stuart Webbs was a gentleman-detective based on the model of Sherlock Holmes, who smartly and elegantly solved even the most difficult cases. Throughout the First World War, this fictional character was popular with German audiences. Only from 1918 Ernst Reicher turned to other topics. 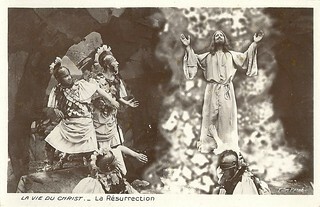 Reicher's most elaborate production was the epic film Das Buch Esther/The Book Esther (Uwe Jenns Kraft, Ernst Reicher, 1919), with Stella Harf as the tile role and himself as King Ahasverus. 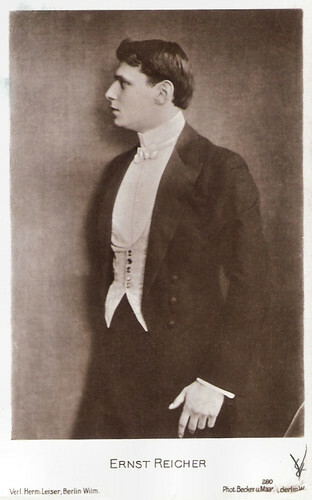 Harf had the female lead in several of Reicher’s films of the late 1910s. 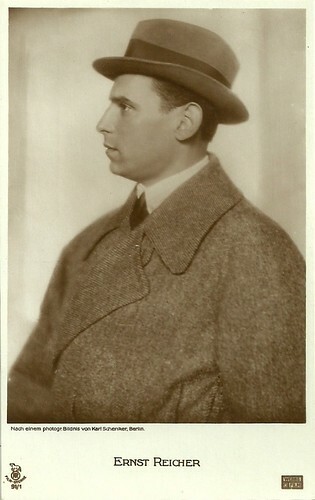 In 1919, Reicher moved the seat of his film company to Munich. 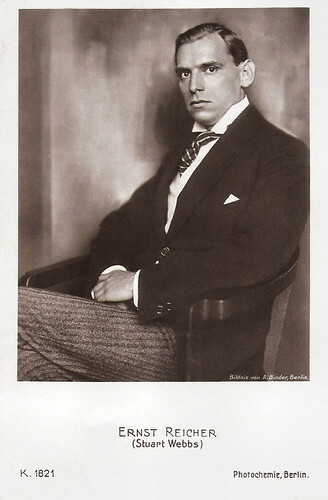 At the beginning of the 1920s Reicher suffered a serious car accident in which he had a skull fracture and a spinal fracture, causing a gap in his career between 1921 and 1923. 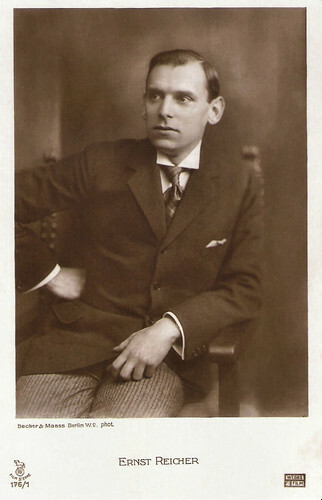 Reicher continued to produce films with his own company till 1923 and occasionally afterwards. Apart from the gap in 1922 he steadily continued his screen acting until 1931, the early years of German sound film. 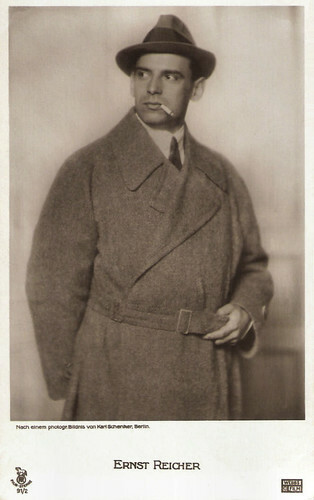 In the mid-1920s he acted in his last Stuart Webbs adventures, now shot at the Munich Emelka studios and often directed by Max Obal. By the end of the decade - and the dawn of German sound cinema - Reicher's star descended. In the early 1930s he had only small parts, his last German part being a minister in Rasputin (Adolph Trotz, 1931/1932) starring Conrad Veidt. 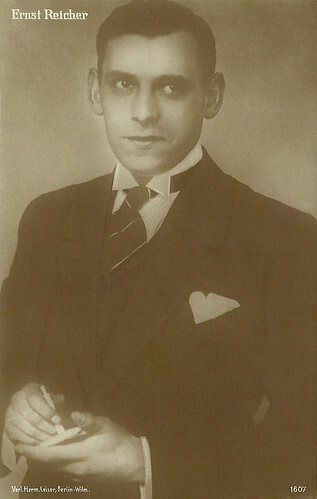 After the Nazis took over, the Jew Reicher emigrated to Prague in 1933, where he fell into oblivion. His last, tiny role in the remake Le Golem/The Golem (Julien Duvivier, 1936) was cut from the final version. On 1 May 1936 he was found dead in a Prague hotel room, "in a small narrow little room, located in a road that was far from the stages of glory". He was 50. In the 1920s he was married to actress Stella Harf. 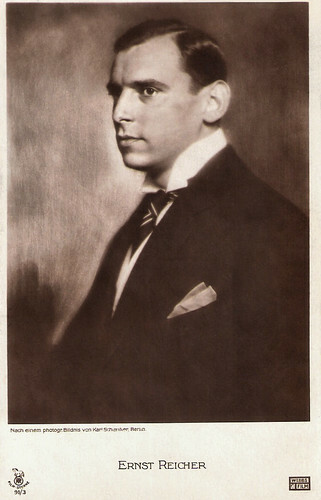 His half-brother Frank Reicher (1875-1965) and his sister Hedwiga Reicher (1884-1971) have also worked as actor. 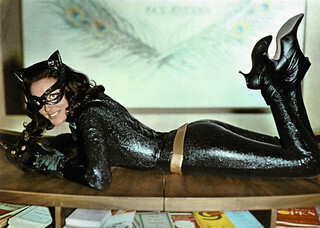 German postcard by Rotophot in the Film Sterne series, no. 91/1. Photo: Webbs Film / Karl Schenker, Berlin. German postcard by Rotophot in the Film Sterne series, no. 91/2. Photo: Karl Schenker, Berlin / Webbs Film. German postcard by Rotophot in the Film Sterne series, no. 91/4. Photo: Webbs Film / Karl Schenker, Berlin. German postcard by Rotophot in the Film Sterne series, no. 94/3. Photo: Karl Schenker / Webbs Film. German postcard by Rotophot in the Film Sterne series, no. 176/1. Photo: Becker & Maass, Berlin / Webbs Film. German postcard by Rotophot in the Film Sterne series, no. 176/2. Photo: Becker & Maass, Berlin / Alba Film. Sources: Filmportal.de, Stephanie D'heil (Steffi-Online - German), Wikipedia (German and English) and IMDb.